Imagine an artificial kelp forest of yarn that can extract uranium from seawater. Sound like science fiction? Not if Chien Wai has anything to say about it. Wai is president of LCW Supercritical Technologies, a company based in Moscow, which develops green technologies for environmental and materials research. Together with researchers at the Pacific Northwest National Laboratory in Sequim, Washington, they have created a technology that is capable of filtering uranium and other heavy metals from the open ocean. Where is this uranium coming from? It’s all perfectly natural. Over billions of years, it’s been eroded from rocks on the Earth’s surface, leached from the ocean floor, and ejected from volcanic activity. It’s a process that’s been happening for so long, the ocean is almost perfectly mixed. If you were to get glass of seawater from anywhere on Earth, you would find approximately the same amount of uranium compounds in it. 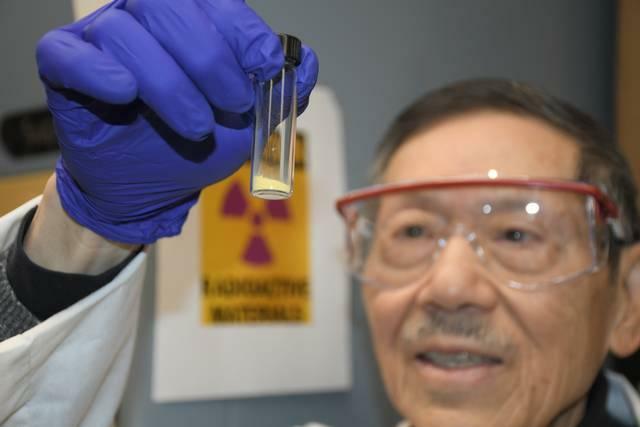 Pulling materials like uranium from the seawater is of great interest to the Department of Energy, said Gary Gill, a researcher at the national laboratory who is working with Wai to develop and test this method. Traditional sources of uranium, mined from the ground, are limited and have a high environmental cost. The ocean represents a vast, untapped source free of these concerns. How much uranium are we talking about? An Olympic swimming pool full of seawater would contain approximately 8 grams of uranium, the mass of a U.S. dollar coin. That may not sound like a lot, says Gill, but you have to appreciate just how big the ocean is. There’s more than 500 times more uranium floating in the sea than there is in all the world’s land-based ore sites combined, approximately 4 billion tons. After the experiments, Wai took the fibers back to his company’s lab, located on the University of Idaho campus, where he was a professor for 35 years. There, he and his team performed the chemistry needed to extract the uranium as a compound known as yellowcake. This material could then be enriched for use as nuclear fuel. The team was able to extract 5 grams of yellowcake from the fibers, about the mass of a nickel. Based on this success, Wai’s company has applied for further funding to test the technology in the field. This test, to be led by the national lab’s researchers, would be in the Gulf of Mexico. The adsorption process is more efficient in warm water and they expect an increase in the amount of yellowcake that can be extracted by three to five times. The simplest deployment would be essentially a vast artificial kelp forest on the ocean floor. Long bundles, perhaps 60 yards long, would pull heavy metals out of the sea as ocean currents passed through them. This forest could be deployed behind ships in similar fashion to fishing nets, the bundles connected together with large cables. Once they do their work, they could be reeled in and sent off for processing. Another option, Gill said, could be something akin to an oil platform. With a source of power on board, such as wind or wave turbines, the bundles could be actively moved on a conveyor belt-like system where they could be deployed and processed continuously. Of course, any kind of large-scale deployment in the oceans requires a lot of study on the possible environmental effects. At this point, the fibers have been tested and found to be themselves nontoxic, Gill said. Preliminary evidence shows that the chemicals used to collect the uranium, both before and after being loaded, also exhibited no toxic effects. There is the potential to use this as a tool to address environmental disaster as well. Wai envisions the technology being used to clean up mining sites and tailing ponds or even to remove metals such as lead from drinking water. Published: Sept. 3, 2018, 8:45 a.m. Updated: Sept. 3, 2018, 5:56 p.m.